Imperial Barber Shop - News: What is the difference between The Traditional Shave and The Imperial Shave? 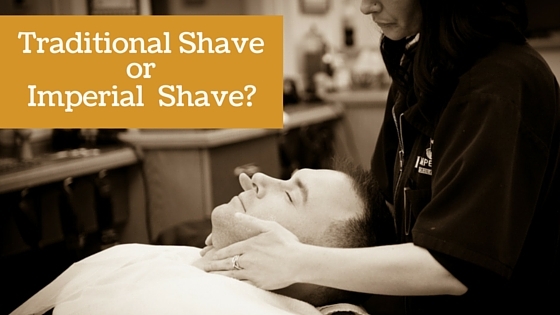 What is the difference between The Traditional Shave and The Imperial Shave? Imperial Barber Shop is recognized as one of the best quality shaving destinations with our quality and care is second to none. Weddings, graduations, a father and son outing, are more memorable when sharing the experience of a professional shave. The Traditional Shave is a very popular shave that takes under an hour to complete. We allow the time to prepare the face with professional shaving products and steaming hot towels. Advanced shaving skills performed by the Barber promotes amazing results with closeness while preserving the skin. The Imperial Shave is the ultimate luxury of shaves. Often considered as a spa treatment experience, this shave usually takes a little longer so that extra preparation enables our Barbers to perform the closest and relaxing shave experience possible. Multiple steamed hot towels, colognes and high-end professional shaving products combined with plenty of care is the essential focus for making this service exceptional. The best part is the 5 o'clock shadow won't be back for a very long time since our shaves finish so close.